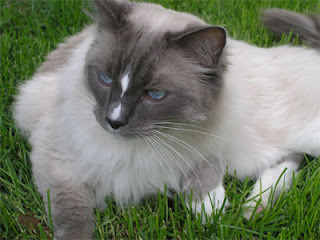 The Ragdoll is one of the highly prized cat breeds around the world. The beautiful cat dates its origin back to the nineteen sixties when it was first developed in California, United States. Since then it has undergone a few changes but it still remains one of the best varieties among domestic cats as far as temperament and looks are concerned. A relatively big cat, the average Ragdoll weighs in the range of ten to twenty pounds, with males being larger than average females. Owing to their loving and sweet nature, Ragdolls make excellent pets for a household. They are playful though they keep their claws sheathed during play. They are gentle and affectionate animals and are also considered often to be the most loving of all cats. They follow their humans around everywhere, displaying a tender attitude towards them. The single layered coat doesn't shed or tangle easily and therefore does not require as through grooming as that of the Persian.